The red walnut is a variety of common walnut (Juglans regia), also called Persian walnut, English walnut or Carpathian walnut. It was obtained by grafting a naturally occurring common walnut with red skin onto a selected common walnut tree with brown skin in order to perpetuate the new variety for commercial purposes. The result of this experiment was Some experts differentiate between the Persian walnut and the English walnut denominations, saying that the term Persian walnut is used to refer to all common walnut species and may include varieties with particular or rare traits, while the term English walnut refers to only the most common commercial varieties of the common walnut. The main idea is that the red walnut first occurred in nature as a result of a natural mutation that allowed a common walnut species with brown skin to develop red skin instead. This was not an isolated case as other common walnut species with brown skin also developed red skin. There are also numerous cases of wild common walnut trees that produce nuts with dark red to purple skin naturally. These can be found in wild settings throughout Europe, including Germany, Austria and the Czech Republic, where they are called blood walnuts, and records of their existence in Europe date back to the 18th century. In other words, it would appear that the common walnut is not just brown, but also comes in shades of red and purple. Just like there are black, red and white currants, red and yellow raspberries, white, yellow, orange, red and purple or black carrots (see Properties and Benefits of Black Carrots) or black, red, pink and white mulberries (see Properties and Benefits of Mulberries). And one of the reasons why there seems to be more brown walnuts is that their colored was preferred and thus more commercial interest was shown in this variety over time compared to others, resulting in more intensive cultivation and efforts to develop better tasting, hardier cultivars. The first red walnut tree for commercial use was developed in 1991 and patented in 1999 by researchers from the University of California at Davis. Two popular cultivars resulted, notably the Robert Livermore red walnut (‘Red Zinger’) and the Yolo Red. They are the most commonly available cultivars in the US. However, they are not the only ones. Other cultivars such as the Red Danube walnut in Europe (‘Rouge de la Donan’) are enjoying growing popularity. You may wondering why was there need to research the propagation of red walnuts and cross them with regular brown walnuts if they were already growing naturally in the wild? First of all, like all rare plants occurring naturally in the wild, there is a chance that the species may somehow go extinct. It helps to pick it up and (learn to) grow it ourselves for conservation purposes. There is also always a chance a new species we may have just discovered is not actually new, but rather a remnant of ancestral plant world and it could teach us a great deal about our world in the past, climatic events and possibly even about future scenarios of evolution. Secondly, most plants hold amazing medicinal potential. In them rests the latent prospect of new discoveries that may change the course of medicine for the better. For example, all new characteristics in a plant food or medicinal plant indicate new health effects. In the case of red walnuts, the thin red-scarlet pellicle covering the kernels is a source of pigmented antioxidants that bring a great contribution to the overall nutritional value and health benefits of the walnuts. 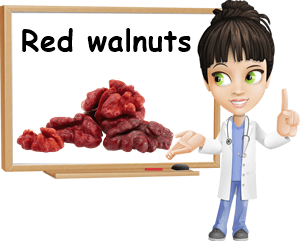 Moreover, enzymatic activities in the red walnut, such as the suggest not only a potentially higher antioxidant value compared to regular brown walnuts, but also hold potential for use in investigations regarding genetic disorders or production of more effective essential medication. Red walnut color varies from a bright red to a darker red, even reddish purple, depending on the variety and origin. The cultivars commercialized in the US are usually a vivid cherry red color. But some European red walnuts in the wild come in various red to purple shades, with color not being consistent from tree to tree. Only the thin skin covering the kernels is red; the kernels themselves are cream colored, just like those of the common walnut. The shells are a dull tan color and the walnut as a whole is larger. As for taste, red walnuts have a slightly sweeter taste than brown ones, with a creamy texture with earthy flavor notes, but without the faint piquant aftertaste of brown varieties. Because red walnut trees are a novelty and relatively rare in the commercial setting, the kernels can be rather expensive and not as easy to find. Price varies from 10 dollars per pound to as much as 40 dollars per pound of kernels. Red walnuts are high in vitamins B1, B2, B5, B6 and B9, iron, magnesium, phosphorus and zinc and boast an excellent manganese content. The variety also provides small amounts of vitamins B3 and E, calcium and potassium. They have a healthy carbohydrate profile: the moderate total carbohydrate, high fiber, low sugar and low net carbohydrate content make red walnuts good for diabetes and managing blood sugar levels when consumed in limited amounts. Although high in fat, most of the fats in the kernels are healthy polyunsaturated fats, including Omega-3 fatty acids, Omega-6 and Omega-9, monounsaturated fats and smaller amounts of saturated fat. Saturated fat content is estimated to be similar to other common walnut varieties: under 8-10%. Also high in protein, the red walnut kernels are good for muscles and make an excellent brain food. Lastly, 100 g of raw kernels provide an estimated of 650 kcal (kilocalories). As for the red color of the kernel skins, it’s indicative of pigmented antioxidants of the anthocyanin family such as delphinidin and cyanidin compounds. Given their nutritional profile, red walnuts provide benefits such as weight management, blood sugar control, benefits for skin appearance as a result of fatty acids and vitamin E, benefits for muscles as a result of protein content, energy and tonic action thanks to iron and B vitamins. Eating a few kernels helps curb hunger and cravings, nourishes the brain, supports nervous system activity, especially intellectual effort and provides benefits for bones, immunity, blood pressure and general cardiovascular health. Also see Properties and Benefits of Black Walnuts. 1) What are red walnuts called? In the US, they are simply called red walnuts. Just know they are the same species as regular brown walnuts, essentially a common walnut. 2) What are purple walnuts called? In some parts of Europe, there are naturally occurring varieties with dark red to purple skin which are called blood walnuts because of their darker color. 3) Are red walnuts GMO (genetically modified)? No, they are not. Red walnuts first occurred in the wild as a result of a natural mutation. Researchers simply grafter trees with red-skinned walnuts and regular brown-skinned walnuts to produce a commercial variety with consistent traits (color, taste, texture, shell thickness etc.) that could guarantee stable characteristics over time.